January 24, 2019. 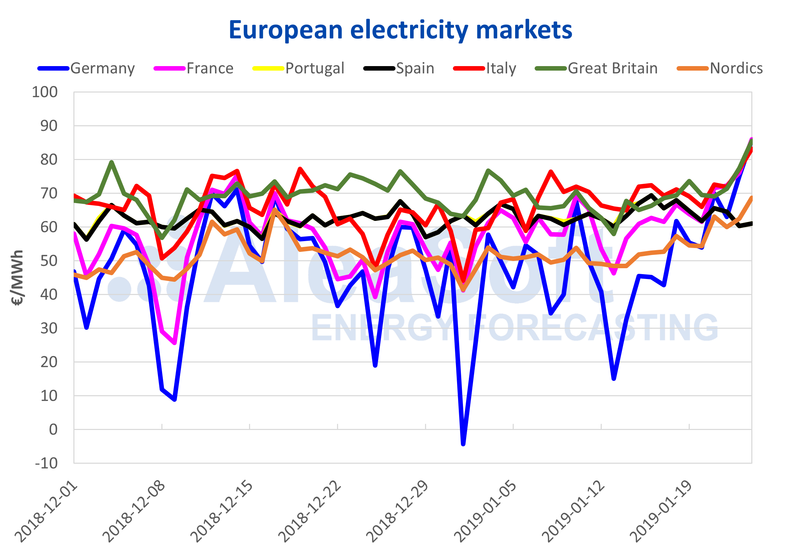 While in the electricity markets of the rest of Europe the cold snap left the highest prices in recent months, the Iberian market reached a record wind energy production that, along with milder temperatures, recorded the lowest prices in the continent. The cold snap in Europe has bottomed out and has left record prices of several months in many markets and even a two-year record in the German electricity market. The prices of the main European markets for Thursday, January 24 are above 80 €/MWh, driven by the increase in demand caused by low temperatures and combined with low wind energy production in most of the continent. Even the Nord Pool market of the Nordic countries, with usually very low prices, exceeded 60 €/MWh and recorded a price of 68.65 €/MWh for January 24. During the cold snap, temperatures in Germany have been 5.1 °C below the historical average, and 3.3 °C in France. On Saturday, temperatures will begin to recover, but mid-term forecasts indicate that the month of February will be cold and dry in the north of the continent. Meanwhile, the Iberian MIBEL market in Spain and Portugal registered the lowest prices of the continent during the cold snap. 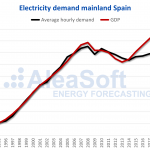 In the Iberian Peninsula, temperatures were not as low as in the north of the continent and, taking advantage of a significant increase in wind energy production, prices remained at the level of 60 €/MWh. The volume of wind energy traded in the OMIE daily market for January 23 amounts to 382.1 GWh, the second highest value in the history of the market. As for the wind energy finally produced, with provisional data from the electricity balance of Red Eléctrica de España (REE), January 23 registered a new record with 376 GWh produced, surpassing the previous record of February 12, 2016 with 365 GWh. This situation of low prices in the Iberian market and high prices in the centre of the continent establishes the flow of interconnections between Spain and France in export direction towards the French country. The amount scheduled to be exported to France on January 24 amounts to 56.2 GWh and not a single imported GWh, values that were not seen since March 2018. The seasonal weather forecasts indicate that the month of February will continue to be cold and dry in the northern part of the continent, affecting important markets such as the Nord Pool of Nordic countries, and the British, the German and the French markets. The lack of rainfall that will affect hydroelectric production and the low temperatures that will affect the electricity demand have pushed up the price of electricity futures in European markets of all maturities. French electricity futures for the second quarter settled yesterday at 50.27 €/MWh, a rise of 4.4% week-on-week, and 50.02 €/MWh in the German market, a rise of 5.1%. For the southern part of the continent, the forecasts for the coming months are less severe, with warmer temperatures and more rainfall. 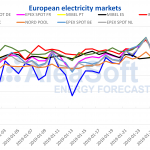 These forecasts slowed down a bit the rise in electricity futures in the Iberian OMIP market that also followed the path of increases of the other European markets. The rise in futures for the second quarter remained at 2.7%. The price of Brent oil futures suffered a slight decline of 2.6% this week, but the upward trend of this 2019 seems firm despite the uncertainty about the growth of the world economy, but sustained by the cuts in production by the exporting countries. The cumulative rise since the price hit bottom in late December is 20.4%. European gas and coal futures are trading at lower prices than in the previous week, but the trend is towards recovery, driven by weather forecasts of persistent low temperatures in the coming weeks. The price of TTF gas futures decreased by 1.5% compared to the previous week, and that of the API2 coal, 2.6%. The price of the EUA CO2emission rights recovered the level of 25 €/t on Tuesday, January 22, although yesterday Wednesday 23 settled at 24.71 €/t. This price recovery occurred despite the fact that there is still no agreement on the Brexit and this creates uncertainty about the supply of rights that will be in the market after March. 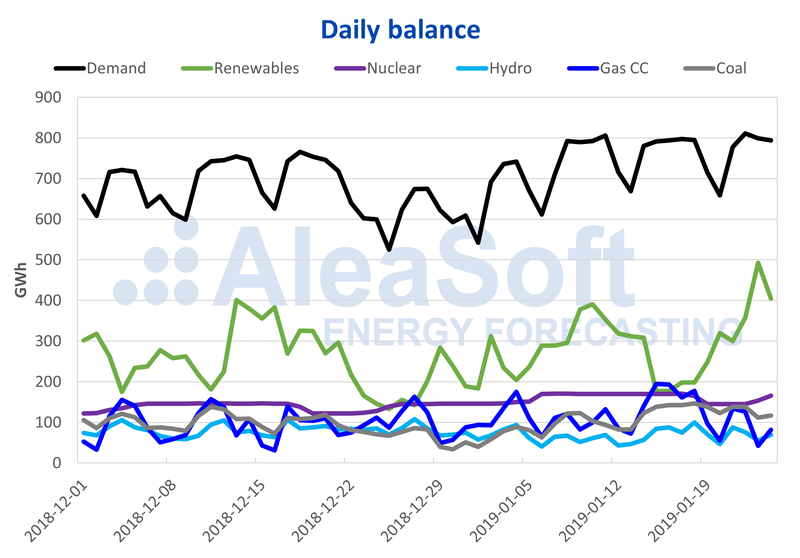 Electricity demand, according to AleaSoft‘s estimates, will decrease by 0.3% this week from January 21 with respect to the previous week. But what marked this week was the record of wind energy production set on Wednesday 23 that exceeded by 3.0% the previous record of February 12, 2016. This increase in wind energy production was detrimental mainly to the production of the gas combined cycles, which had a production 77.2% lower than the previous Wednesday. The increase in wind energy production this week of January 21 compared to the previous week will be of 107.6% according to AleaSoft’s forecasts for the rest of the week. For next week, of January 28, according to AleaSoft, it is expected that production will remain relatively high, although with a drop of 7.7% compared to the present week. Solar energy production, which includes both solar photovoltaic and solar thermal, will increase this week by 26.7% compared to the previous week. Hydroelectric reserves continue to decrease and stand at 9671 GWh this week, 41.5% of the total capacity of the system, and more than 15% below the historical average.